Ahoy there! It’s Talk like a Pirate Day and at PurpleTravel we’re all wearing our eye patches, wooden legs and cussing parrots. So listen maties, we got you a list of the places aroun’ them there seven seas that treasure has been hidden. Oak Island, just off the southeast coast of Nova Scotia, is probably the most excavated site in the world for buried treasure, and yet, it has still failed to deliver up the goods. The story begins in 1795, when Daniel McGinnis and a friend noticed a circular depression in the ground, as if a pit had been dug and then filled in again. They dug to a depth of 9.1 metres, believing that something of value must have been buried there. Initially, they discovered a layer of flagstones followed by traces of pickaxes on the rocks and some stories suggest that they found platforms of logs at 3 metres intervals. Their story spread and was quickly linked to the missing treasure of Captain Kidd and even the notorious Blackbeard – Edward Thatch (Teach). Over the following centuries the pit has been excavated many times, even by Franklin D. Roosevelt. However, the pit is claimed to be ‘booby trapped” and has regularly flooded. 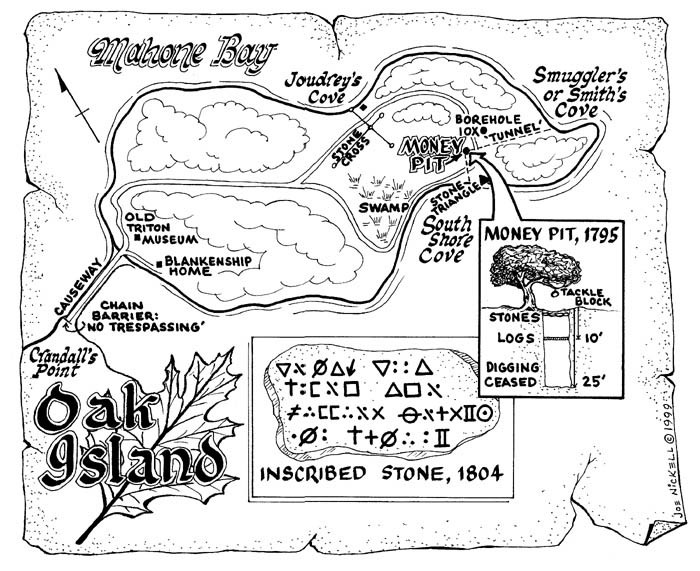 The most alluring clue found so far was a code inscription on a flat stone which, when translated, apparently stated: “Forty feet below, two million pounds lie buried.” The deepest excavations reached 72 metres and over the years some six people have died trying to find whatever is buried on Oak Island. During the Second Anglo-Boer War, the descendants of the Boers realised that their capital, Pretoria, would soon be captured by British troops. They commandeered as much gold as they could from government reserves, banks and the mines and minted many thousands of new gold coins. Much of this gold is believed to have travelled with the Boer President, Paul Kruger, as he journeyed eastwards towards Mozambique to escape the advancing British. He departed, by ship, for France on the 19th of October 1900. The gold remained behind, hidden somewhere in the bushveld of the North Eastern Transvaal. It has never been found. In 1712 AD, Spain began to assemble one of the world’s richest treasure fleets. By 1715, it consisted of five ships of the Nueva España (Mexico) fleet and six ships of the Tierra Firme (Main Land) fleet. Significant amounts of silver, gold, pearls, emeralds and other precious items were loaded at Vera Cruz, Cartagena, Nombre de Dios and Portobello. A further ship, a French merchantman, the Griffon, also joined the convoy. As a further defence against pirates and privateers, the fleet waited until just before the hurricane season before setting off from Havana. A storm destroyed the entire fleet just seven days after leaving Cuba, with thousands of sailors falling to a watery grave. Over the next four years, the Spanish salvaged about half of the treasure, but even today, items of treasure still occasionally wash up on nearby shores. Seven of the ships have been located, but only a small percentage of the treasure has been recovered. The San Miguel, a Nao class vessel, has yet to be found and is believed to have separated from the fleet the day before the storm struck. Carracks are lighter than Galleons, and were often used to carry treasure as they stood a greater chance of outrunning storms and privateers – the purpose, after all, was to get the treasure home. The San Miguel is likely to be one of the richest treasure ships yet to be found. The Knights Templar were once the wealthiest and most powerful military order in Europe, formed to protect those on Christian pilgrimage. They invented an early form of banking, which made them even richer, but they became unpopular with people who had borrowed money from them. By 1291 AD, the Knights Templar were forced out of the Middle East, their popularity further depleted by those who owed them money such as Phillip VI the King of France. On Friday the 13th of October 1307, with the permission of the Pope, Phillip VI, the key leaders of the Order based in France were arrested and tortured into confessions of devil worship. Phillip VI seized their lands and raided their treasury, but found it much emptier than he had expected. Across the rest of Europe, the remaining Knights hid their portable treasure, under threat from the Pope who had called for their arrest. The vast treasure of the Knights Templar largely disappeared and has never been found. An equally intriguing mystery is what happened to the majority of Knights who were never arrested; several thousand men and their flotilla of ships simply vanished. In particular, 18 ships that had been berthed at La Rochelle, France, on the night of the 12th of October 1307 set sail under the cover of darkness just before the initial persecutions and passed out of history. Peter Carl Fabergé and his brother Agathon were Russian jewellers of French ancestry, based in St. Petersburg. Famed for the extraordinary quality, in 1885 Tsar Alexander III (commissioned them to produce the gold and enamel ‘Hen Egg’ for his wife, the Empress Maria. Fabergé was made ‘Goldsmith by Special Appointment to the Imperial Crown’ and over the next 33 years, 52 eggs were made for the Russian Royal Family, along with a further 15 for other private buyers. The 1917 Russian Revolution toppled Tsar Nicholas II, who was executed along with much of the royal family in July 1918. Fearing for his safety, Peter Carl Faberge abandoned Russia travelling first to Latvia then Germany and finally Switzerland where he died in Lausene in 1920. The Fabergé eggs and many other treasures of the Royal family were confiscated and stored in the vaults of the Kremlin Armoury. Some were sold to raise funds for the new regime. Over time eight of the original 52 Imperial eggs have vanished and their whereabouts remain a mystery to this day. In 2007, just one egg, ‘The Rothschild’ was sold at Christies Auction House for $8,9 million.